Posted by Arthur J. Miller Jr. When Union Pacific steam locomotives #4014 and #844 begin their travels in May, North American rail fans will witness a steam show the likes of which have not been seen since Norfolk Southern double-headed N&W Class A #1218 and Class J #611 around the verdant Virginia mountains back in the last century. For those planning to witness and photograph events surrounding the Golden Spike’s 150th anniversary (and I am one of them), the task of capturing images of 60 mph steam locomotives in the wide-open spaces of the great American West will be challenging. In this environment, it is critical for rail fans to be safe, respect non-rail fan visitors and generally display good decorum. Trespass or an injury on railroad property, a major motor vehicle accident, or any sort of disruptive behavior reflecting badly on the railroad enthusiast community could endanger future historic UP steam operations. Afterwards, Class 1 railroads became totally “off limits” to movie studios. Additionally, the process for securing filming authority on the few remaining railroads supporting production work became tedious and much more expensive. The Sarah Jones incident is the reason productions’ real railroad use dropped precipitously and has not fully recovered. Safety professionals supportive of excursions and special operations are concerned the death of another photographer in the path of a UP excursion, or a collision between the Big Boy and a carload of distracted photographers, could permanently extinguish #4014’s and #844’s fires. In order to help ensure future UP (and other railroad) excursions, applying lessons from the late James Bistline might be in order. For more than two decades, Bistline was the Southern and Norfolk Southern company officer responsible for the two railroads’ steam excursion program. In the mid-1970s, Bistline called me at the Knoxville TV station where I worked. 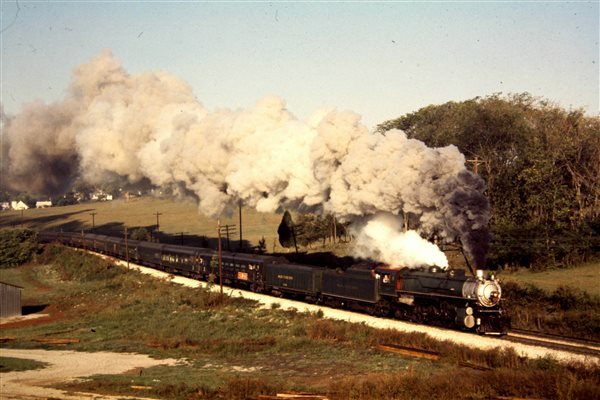 There was a bicentennial steam special running from Knoxville to Bristol in a few weeks. Would I care to find THE two best photo locations on the 120-mile route? I told him there were a dozen places we could shoot…if we hurried. Today, Jim Bistline’s 40+ year-old advice is fully applicable to those memorializing next month’s steam operations surrounding Promontory Point festivities. Advance location scouting will be key to getting what the film production business calls “money shots.” The chances of finding one or two classic photo spots while madly racing ahead of the train are quite small. Train pacing is not recommended. Pacing usually requires speeding. Image quality becomes more important than safe vehicle operation. If a pacer gets into a wreck, the other driver’s lawsuit will certainly include distraction accusations. Don’t worry about crowds intruding in any of your shots. Indeed, including crowds in your views will help tell the story of this momentous celebration of railroading’s illustrious history. Several other extremely important safety messages are worth reviewing. Stay off of railroad property (except, of course, at official public events). Out West, long sight lines mean long lenses and long video scenes that can create dramatic images not possible in the trees, curves, hills and cuts of the Appalachians. In searching for photo locations along the UP, the rolling treeless topography makes it easy to never set foot on railroad property. Respect private property. Western ranchers are generally hospitable and welcoming. However, many ranch entryways and roads are covered by wildlife cameras. Gates left open, broken fences, litter, and trampled fence line vegetation or crops may bring an unfavorable response. Be totally quiet when the train is within sight or sound. Video recordings include sound. And imitating the shouts tornado chasers extrude when a funnel cloud is spotted is plain old bad manners. If all of us who will be out West in a few weeks follow these rules, everyone will enjoy a safe Golden Spike celebration. And, we will have one or two “post card quality” images that will draw praise and rave reviews from all privileged to view them. Arthur J. “Art” Miller, Jr., is a long-time railroad operations and safety manager and film production industry Railroad Coordinator. He has won two AAR safety leadership awards.